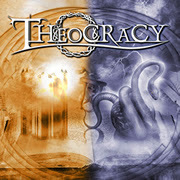 Christian power metal band Theocracy's first album was originally released in 2003, and it was basically a one-man project of Matt Smith. To celebrate its' 10th anniversary the album has been remixed and remastered, and the original drum tracks have been replaced by newly recorded versions by the band's current drummer Shawn Benson. I liked the band's latest album "As The World Bleeds" quite a lot, and the one before that wasn't too bad either, so I was interested in checking out where it all started. Turns out that the elements of Theocracy were very much in place right from the start, even though Matt Smith hadn't totally found his melodic sensibility yet. Don't get me wrong, there's plenty of melody on this album, it's just that the melodies aren't quite as enchanting as on "As The World Bleeds". Even though Matt Smith is american, it sounds like his influences mostly come from this site of the Atlantic. There are some very Helloween'ish moments here, and Edguy is another band that I'm reminded of every now and then, not forgetting the ancestors of the genre, Maiden, Malmsteen and Priest. There are three songs which are over 11 minutes, which is a bit too much. Those songs are good, but I can't help but wonder whether they could have been "compressed" to half of their length. The impact would have been much powerful, now they are a bit overblown.